StitchyDonDesigns: Another Page Finish !!! Thanks, I love that one of the larger dolphins is starting to show now !! Thank you, I really feel like I've achieved something these last few days !!! Just another thirteen pages to go !!! Beautiful. The sea is so realistic. I bet this is a lovely relaxing stitch. Beautiful stitching. Well done on the page finish! Stitch from Stash March !!! Easter Egg Band Sampler Freebie Design!! 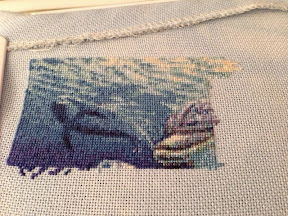 Making Progress and Dreaming of Stitching !! !